Special to the Daily Heidi Curiazza got an early holiday gift this year. 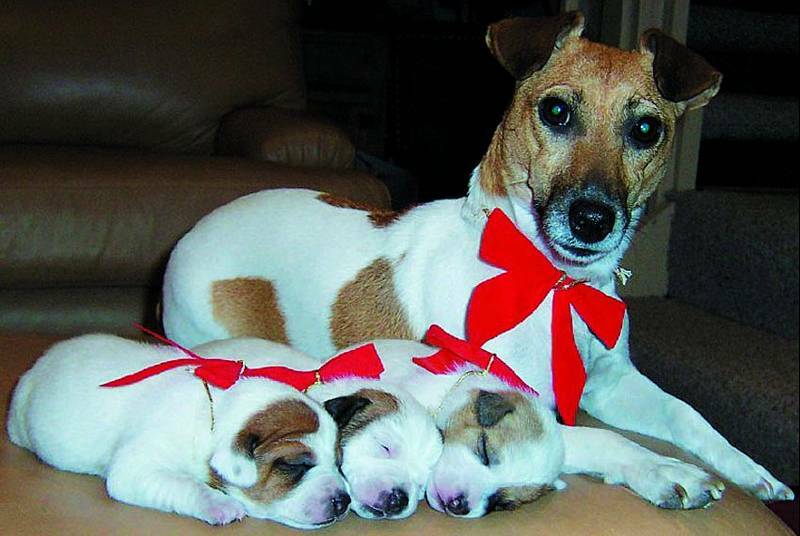 She writes, "Here is a picture of Lily and her new puppies ready for Christmas. The pups were two weeks old (on the 20th)." Good morning and welcome to Summit Up, the world’s only daily column looking for our dog in all the wrong places.Our fearless, 8-year-old pup decided to take a little vacation last weekend. Occasionally, he’ll take an a.m. jaunt around the neighborhood, quickly returning for water and belly rubs. But last weekend, he decided to explore the world a bit more – for five long hours. After an hour, we were worried.We set out on foot looking for his furry black form strolling through the forest but found nothing but a squirrel and a concerned looking golden retriever. Three hours had passed …We jumped into our car with the windows down and snow blowing in our face, calling his name, but to no avail.Just when we were headed back to the homestead, we saw our black Lab sitting outside of a fenced enclosure in someone’s yard over a mile from our house. Sitting and facing him were two huskies. They looked like they were having a lovely little chat.It was like a reunion on a soap opera or a long distance telephone plan commercial: We jumped out of our vehicle, and he ran toward us with his tail wagging. He jumped in the car, and we ecstatically headed home. We think he got lost and was asking the other pups for directions.After we recovered from his disappearance, we thought about how cool it would have been to attach a little video camera to him to capture his five-hour adventure on film.We can only imagine what it would have looked like:Roll in the snow. Chase a squirrel. Lose sight of the squirrel when it runs up a tree. Bark at the tree. Lose interest in the tree and dig a hole. Roll in the snow again. Eat some snow. Pee on a tree. Find some other dogs. Walk around with them for a bit. See some other dogs. Sniff their butts. Roll in the snow. Eat some snow.